MJS Easy Guitar Chords download. Common Rhythms and Progressions in Every Key. Chords are the canvas for any song and any style of music. Using only 3 or 4 chords, guitarists can entertain an audience for hours! Whether a single player at a campfire, an afternoon on the front porch with friends and family, or an open blues jam, folk festival or stadium rock concert- all have one thing in common: CHORDS! 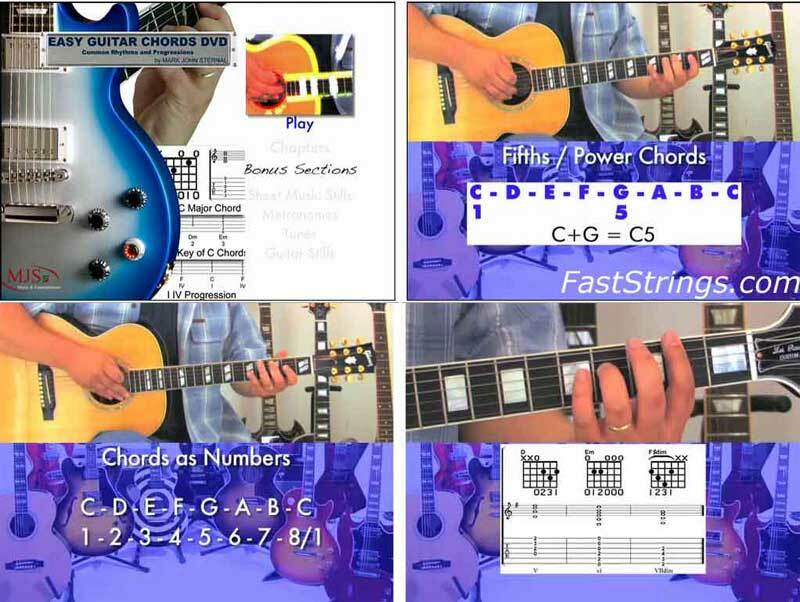 Easy Guitar Chords DVD teaches you easy, basic chords that are found in every key of music, starting with open chords and progressing with time, strength and practice to popular barre chords –all presented in a useful format that shows you how chords are used musically. By introducing rhythms and chord progressions, each section of this unique video course allows you to do more than learn just a handful of chords…you will actually learn to play and make music with them! cool place to go on the net to learn about a good instrument to play. Nice to meet you, need to learn how to play!